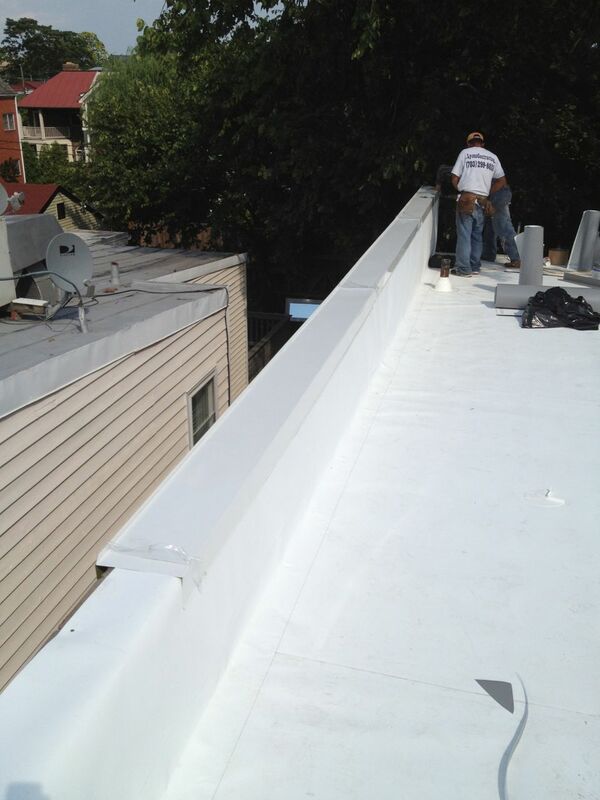 We’ve done quite a few of these row house flat roof replacement, this job was a little different because of the new cornice at the front wall. 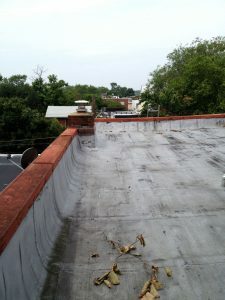 The existing roof in Alexandria, VA wasn’t leaking but the owner knew it was getting to the end of its useful service life, the wall coping (metal cap around the outside walls) was probably original to the 70 year old house and was pretty rusted out. 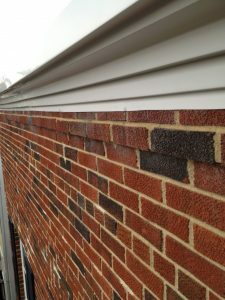 While discussing the job the owners mentioned that they were looking for ways to add some curb appeal to the front of the house; I came up with the idea of a new cornice to add some mass to the upper front face of the house. Cornice (from the Italian cornice meaning “ledge”) is generally any horizontal decorative molding that crowns a building or furniture element— the cornice over a door or window, for instance, or the cornice around the top edge of a pedestal or along the top of an interior wall. 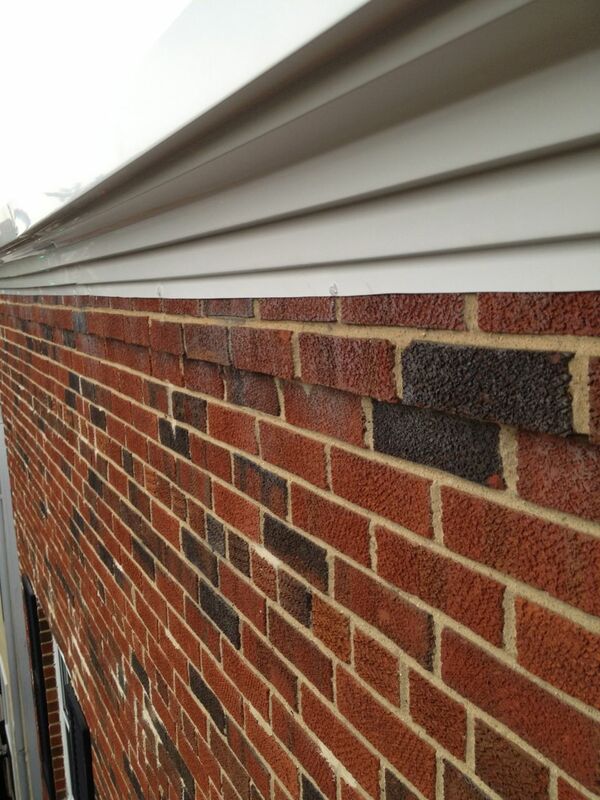 Coping (from cope, Latin capa), consists of the capping or covering of a wall. TPO Roofing: Thermoplastic Polyolefin single-ply roofing a white pliable membrane known for its cool reflective properties and relatively maintenance free service life. The main focus of the job was flat roof replacement in Alexandria, VA; but the opportunity presented itself to really improve the aesthetics. 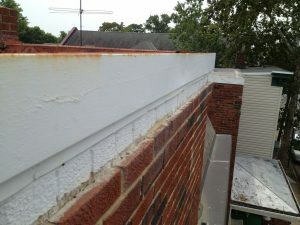 The old wall coping was too small so the previous owner painted the brick below it to make it look bigger; unfortunately I can’t find any pictures from the ground so you’ll have to believe me. 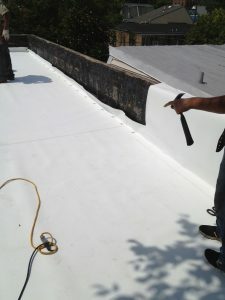 The old roof was a torch applied modified membrane roof laid over an old tar and gravel roof. 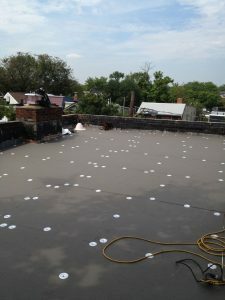 The most recent layer of roofing had been neglected a bit and was starting to fail, small cracks and splitting in seams will lead to leaking on flat roofs that might go unnoticed until they’ve caused thousands in water damage. Have your flat roof inspected once a year to head off any disasters. Off with the old roof; you can see the old tar and gravel roof that was lurking beneath. This was a huge amount of debris, once the modified roof was removed we then swept up as much gravel as we could and loaded it into bags that we lowered to the ground. 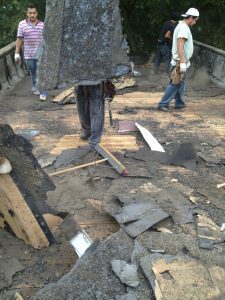 Once most of the gravel was off we then removed the layers of hot tar and paper. Here we’re installing new 1″ polyisocyanurate insulation board over the flat roof deck. 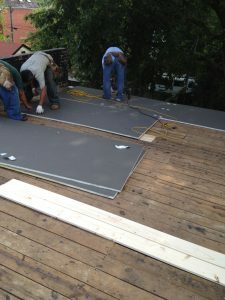 Completed insulation has been fastened down with epoxy coated screws and plates. 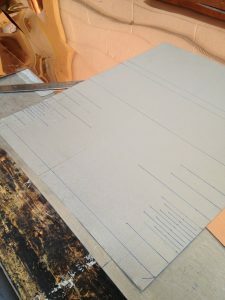 The large silver plates act like washers to hold the insulation board down to the roof deck. 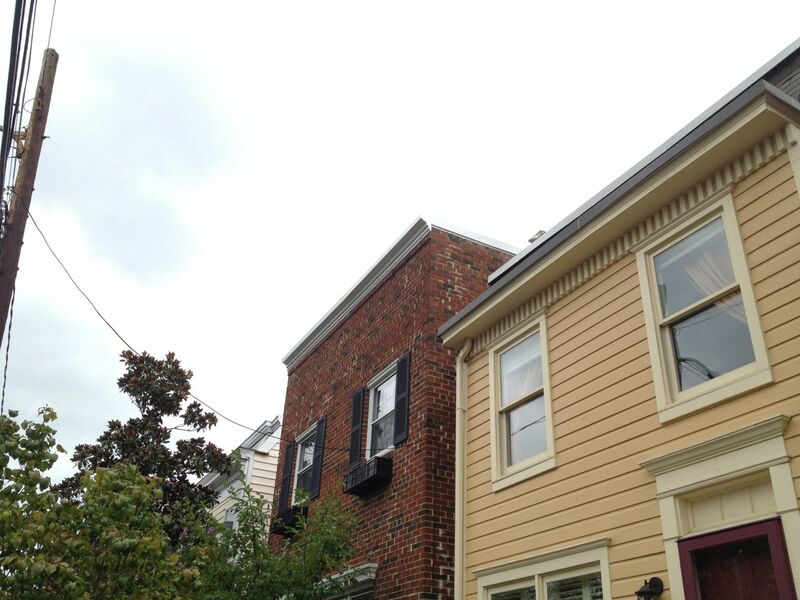 Since the house we’re working on is in the historic district of Alexandria,VA we had to submit a drawing and mock up of our new cornice to the Alexandria, VA Board of Architectural Review, the board liked what they saw and agreed that our work would look appropriate. Once we had our board approval we filed for a permit to replace the roof, cornice and coping. I made a few different profiles but ultimately the owners decided on the design above in white Firestone aluminum. 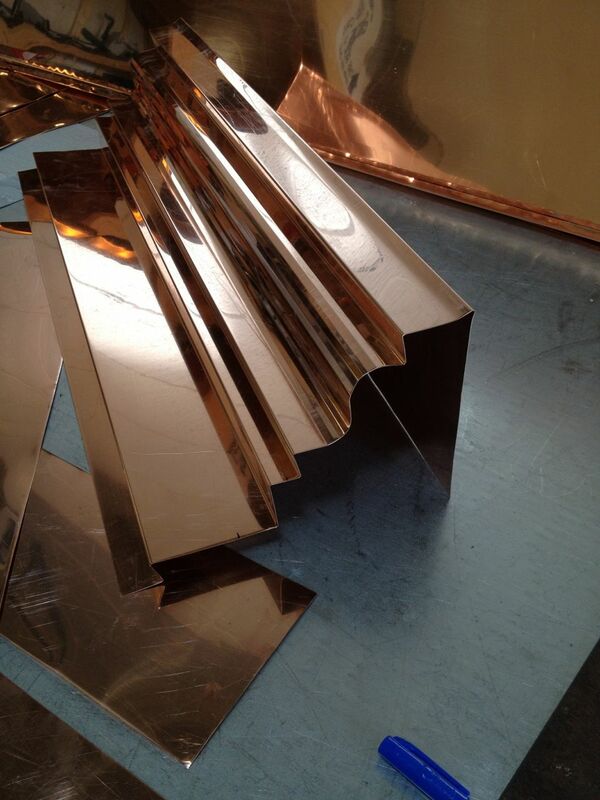 I really wanted to do the coping and cornice in copper- unfortunately I have no control over my client’s checkbook. The lines you see below represent a bend in the flat sheet of aluminum to make up the new cornice, this pattern becomes the master key to make up all the cornice lengths. New sheet metal cornice and coping made in the shop a few days before the job starts; by making the coping before the roof replacement starts we minimize our time on site. 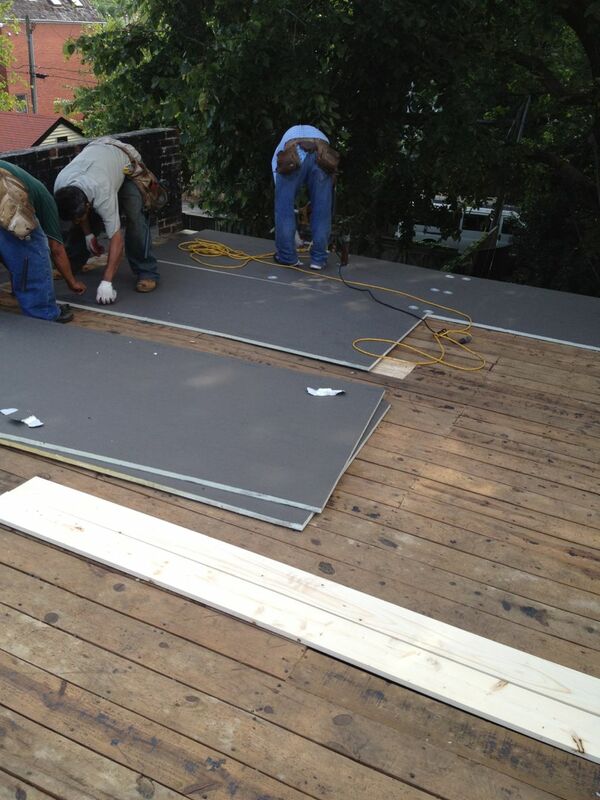 The TPO roof is installed and the new wall coping on the parapet sidewalls is being fit. I order the aluminum sheets with a clear plastic film, the film protects the finish while I’m forming the coping and cornice, once the panels are in place and fastened we peel the protective film off. New flashings on chimney tied into new wall coping on TPO flat roof. 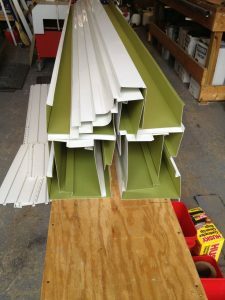 I wanted to be sure my new cornice would survive for the next few roof replacements, so I made them in two separate pieces enabling the roofing membrane to be replaced without damaging the sheet metal. 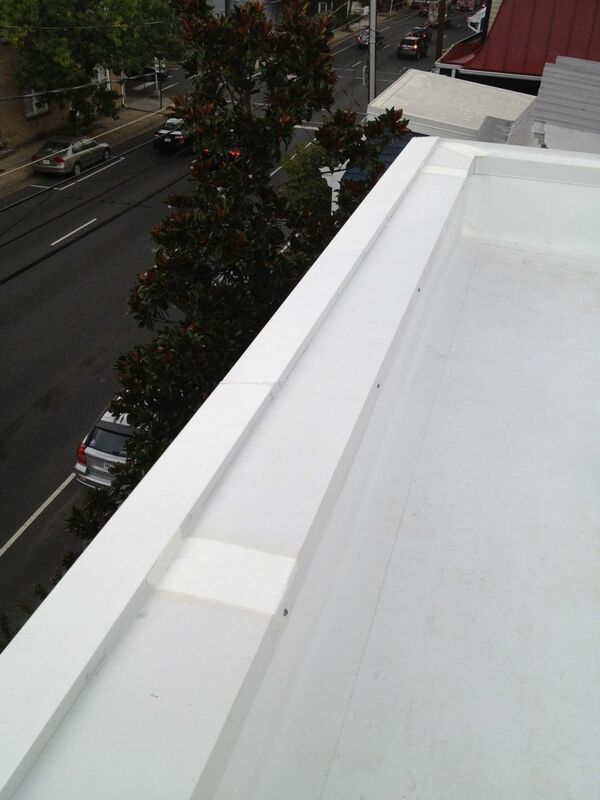 The TPO flat roof we installed today has a service life of around 25 years but since the coping and cornice are made from aluminum and won’t rust they could last for four times that long. 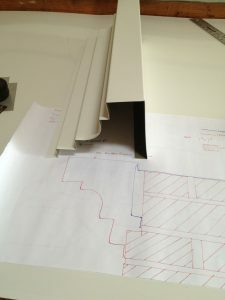 The two piece cornice and coping assembly raises the cornice higher than the coping; this has the added benefit of keeping water from rolling down the face of my new coping- water will eventually leave drip trails if allowed to run down the face. 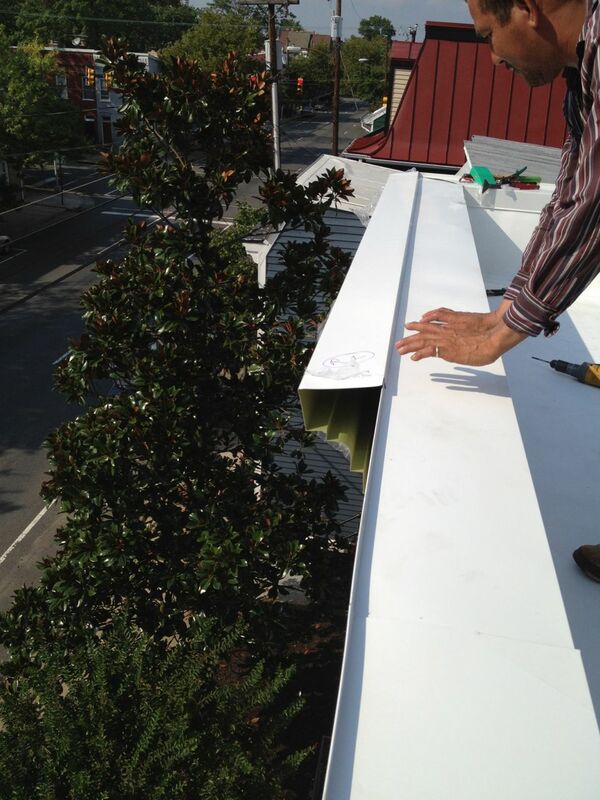 New white aluminum sheet metal cornice and coping for flat roof. My new cornice covers the area the previous owner pained white- and attaches to the brick corbel that was already built into the face of the row house . 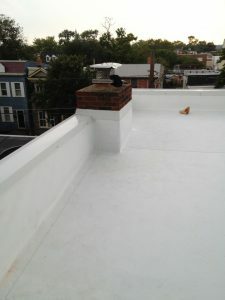 If your row house needs a new roof and some curb appeal please call 703-299-8888 or fill out the form to the right and I’ll be right with you.